Acumyn’s AQUA platform has the power to improve the efficiency and workflows in radiation therapy departments—including providing automated daily quality assurance (QA) for radiation therapy clinics and hospitals. AQUA can directly interface with automated quality control software and hardware to minimize the burden of QA activities. These capabilities will be on display at the ESTRO meeting this week in Barcelona, Spain, including AQUA’s integration with QA tools from early adopters Standard Imaging and PTW. 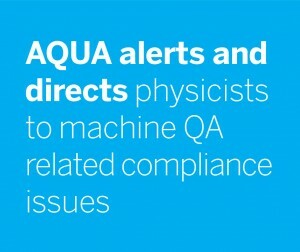 AQUA is an end-to-end system for managing department-level quality assurance workflows and scheduling in radiation therapy. AQUA was originally invented at the Princess Margaret Cancer Centre. The product has been further developed by Acumyn, in cooperation with Techna, to commercial medical device standards. AQUA is a product of Acumyn, a privately held Ontario corporation, sold and marketed by Elekta under an exclusive agreement. Demonstrations of this vendor-neutral system will take place at Elekta’a booth (#400) at the 3rd ESTRO Forum.